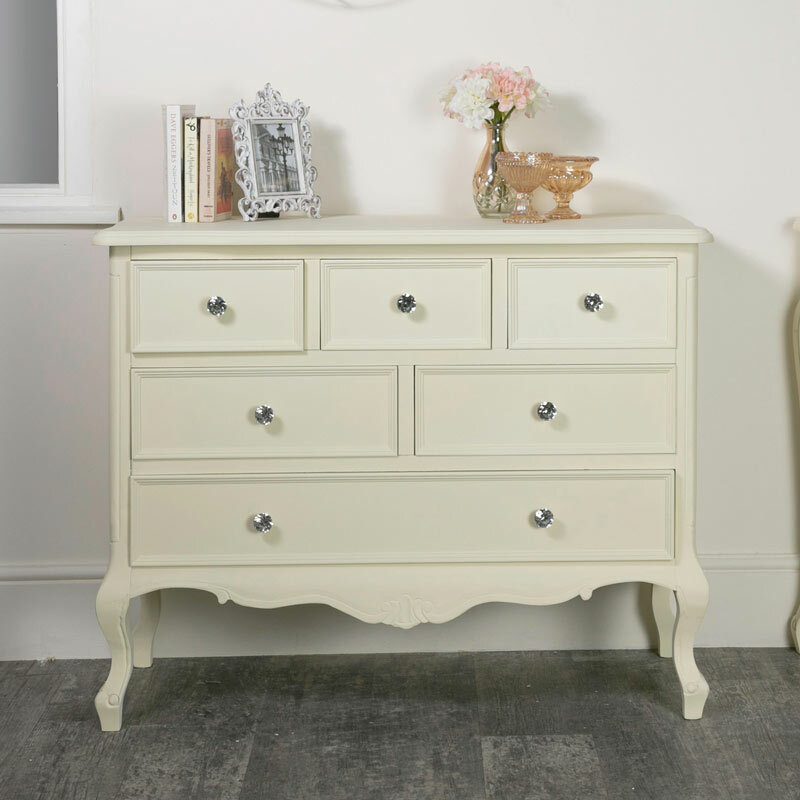 This large cream chest of drawers is a beautiful piece of vintage shabby chic styled bedroom furniture. Dresser storage with 6 drawers. Also available in white and grey. 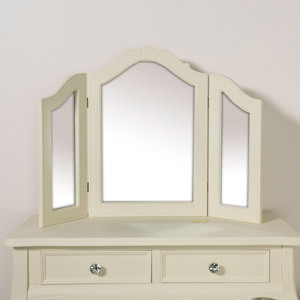 Also matching bedroom set available Ideal clothing storage for a vintage French themed bedroom. 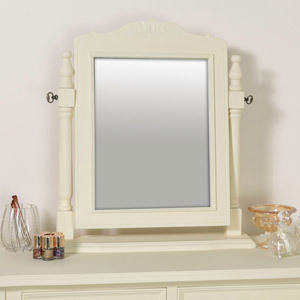 Gorgeous carved detailing and crystal style handles add that glam, luxurious look. 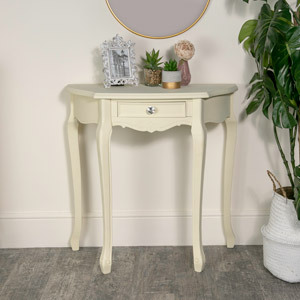 The Elise Cream Range offers excellent styling for your home decor. 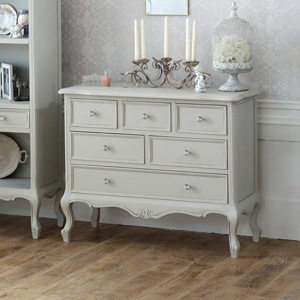 Classic French, shabby chic design with matching furniture for the bedroom, living room and hallway. 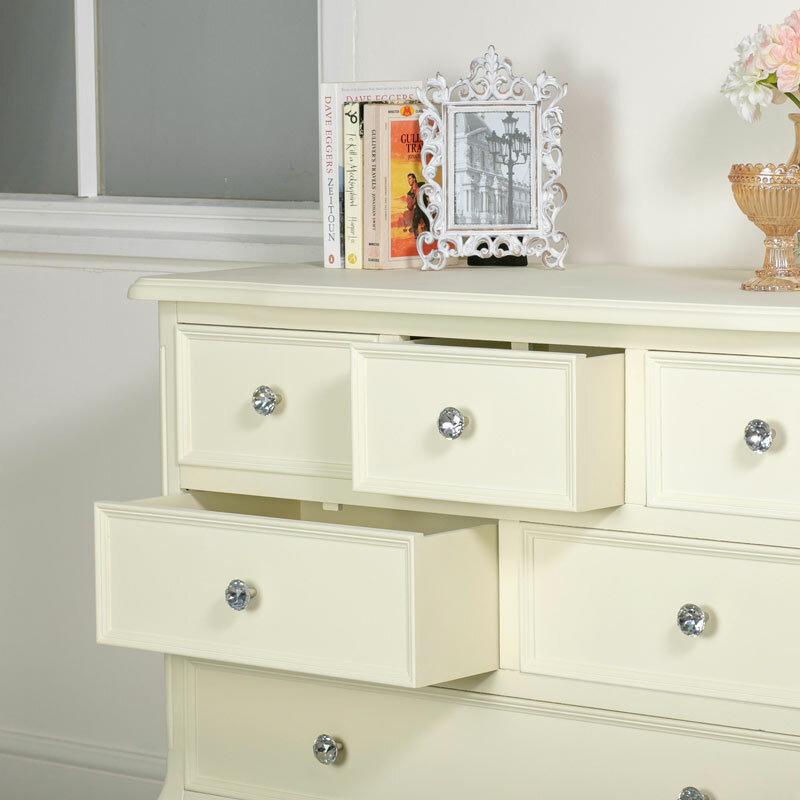 This fantastic range includes dressing tables, bedsides and a selection of chest of drawers in great size options. This chest of drawers isn't just limited to the bedroom, it can also be used in the living room or hallway to offer more storage options and surface display for pretty displays and accessories. 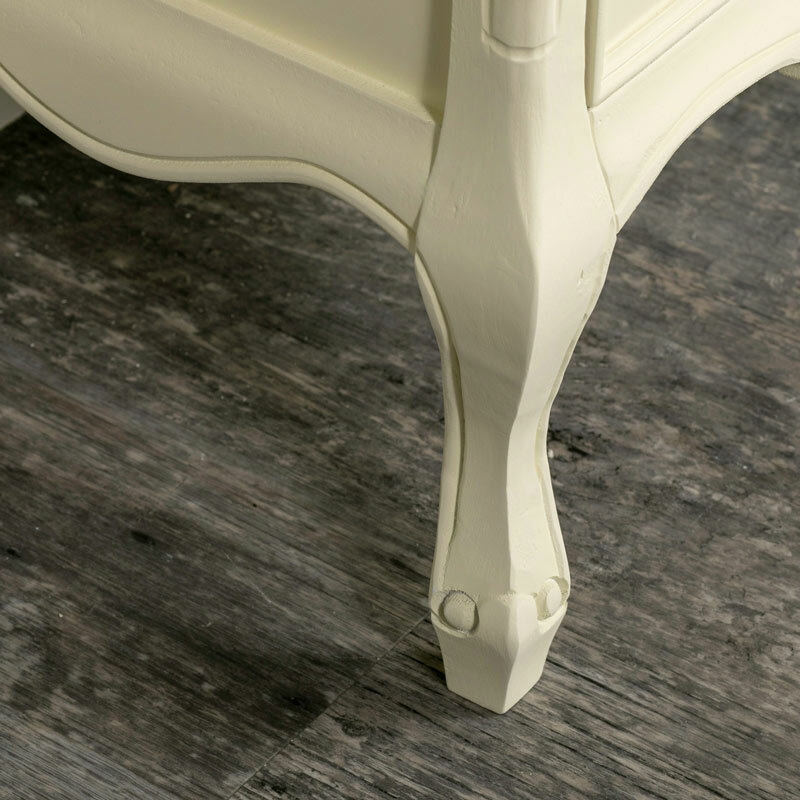 This large cream chest of drawers is a beautiful piece of vintage shabby chic styled bedroom furniture. Dresser storage with 6 drawers. Also available in white and grey. 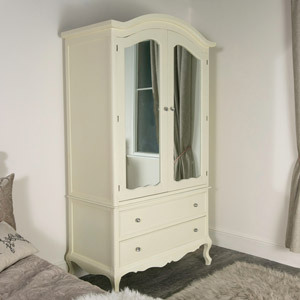 Also matching bedroom set available Ideal clothing storage for a vintage French themed bedroom. Gorgeous carved detailing and crystal style handles add that glam, luxurious look. 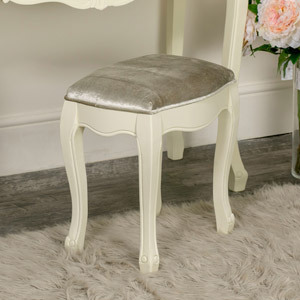 The Elise Cream Range offers excellent styling for your home decor. 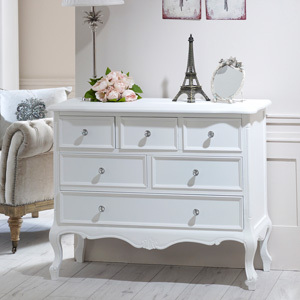 Classic French, shabby chic design with matching furniture for the bedroom, living room and hallway. 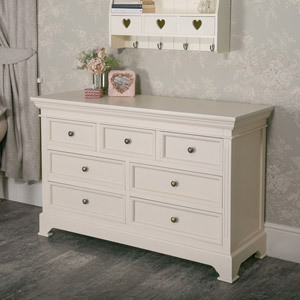 This fantastic range includes dressing tables, bedsides and a selection of chest of drawers in great size options. 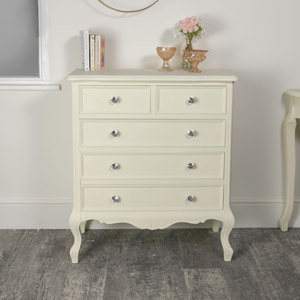 This chest of drawers isn't just limited to the bedroom, it can also be used in the living room or hallway to offer more storage options and surface display for pretty displays and accessories. Made from wood and painted in a cream finish. The chest of drawers comes fully assembled and weighs approximately 21kg. Larger items such as this chests of drawers are on a 2-12 working day service. We can offer quicker delivery via a pallet courier with an extra charge, this can be selected at the checkout.